Something up with your computer or laptop but can't pinpoint the problem? We're all been there! With so many possible issues that can occur it is sometimes difficult to know exactly how to fix it. Well that's where we come in! Our dedicated team of repair technicians have years of experience under their belts and can diagnose any number of problems from viruses and malware down to individual component problems and even down to individual chips on a component! So stop stressing, bring your computer in today and let the professionals identify the problem for you. If you wish to give the go ahead to repair the fault, this £10 diagnostic charge will be scrapped! Why not let us collect your computer from your doorstep? Click here for info. For details on any of the services below, please click on the repair description. Please note that all pricing is VAT inclussive but services such as component installation and replacements does not include the price of the component. Not sure what service you need? Give our technicians a call on (01382) 206406 for assistance! If you already have a unique reference from a repair, log in here. With a huge growth year on year, our repair centre has transformed from a single room into a dedicated 5,000 square foot unit in our Brown Street Mill and from a single technician to a whole team of trained and experienced repair experts! This year we have also invested money into state of the art machinery specifically for PC, laptop and console repairs, ensuring our repairs are well above the standard of most other companies. Knowing just how busy people are throughout the day has led us to believe a typical 9 to 5 repair centre was not the answer. That's why the 3000rpm Repair Centre is open 7 days a week (yes, even sunday!) and from 8am until 8pm weekdays. That means that even if you have a hectic job, theres always time to drop off and hand back your computer! So how do you know if your computer is ready? The days of frantically phoning to check if your repair is complete during a tight lunch break is over! At 3000rpm we have integrated both live and dynamic text message and email updates into our repair system so you know when your computers ready, when you can collect it and the price! Additionally, our system generates a unique identity code for your computer so you can check the status online in real time to see the problem, whos working on it and how long it is going to take! We are proud to say we are open longer and later than any other Repair Centre in Scotland to ensure theres always time for you to hand in or collect your system, even on Sunday! We are located in Brown Street, just off the Westport, 5 minutes from the Dundee city centre making it convenient without all the traffic and restrictions on parking! Our repair centre has a huge car park so getting a space easily is never a problem. As well as carrying out repairs in our Repair Centre, we also offer a dedicated callout service for both businesses and households. Our experienced technician will come direct to your location and assist with any problems without the bother of you having to unplug everything and bring them to us! Even better, our technician will have a range of specialised tools with him, ensuring work is carried out without having to go away for the right equipment! All callouts start at £40 which covers the callout fee and the first house with each 15 minutes costing £10 thereafter. Additionally, we can collect or delivery your laptop, PC or console if you live in the DD1 to DD5 postcode area of Dundee. This service is available on Monday, Wednesday and Friday and costs £2.50 per collection/delivery. 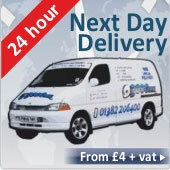 All deliveries will take place between 6pm and 8pm so if you request for this service please ensure you are home! If you would like your computer picked up from us, please fill in the form below! We are so confident in our repairs service that we only charge you once we have carried out the work so you know what you're paying for. We accept both cash and all major cards at our repair centre for easy payment. The text message or phone call you will receieve upon completion of the repair will quote the final price for the service, otherwise you can log into your job using your unique ID above. If you require a quote before any work is carried out, please notify a technician.